I think i’ve taken a pretty long break (been in the process of moving to a different continent!) so let’s start up again with a bang! This recipe is so quick to make, and, not gonna lie, it’s quick to finish too. In a sauce pan bring the sugar and water to a boil and simmer till the mix starts to bubble and turn a caramel brown. Then pour in the 1/2 cup of cream and let it simmer for a minute or so, then add most of the sliced bananas (You can add them all, but I like to keep some uncooked to add texture to the pie) and all the pecans and let them cook on a low heat for 3-4 minutes. Then all you have to do is pour the mixture into the pie crust, spread the remaining banana slices over, let the mixture cool, then dollop over the cool whip. I added some chocolate chips before the cream, but that’s not necessary. That’s all! 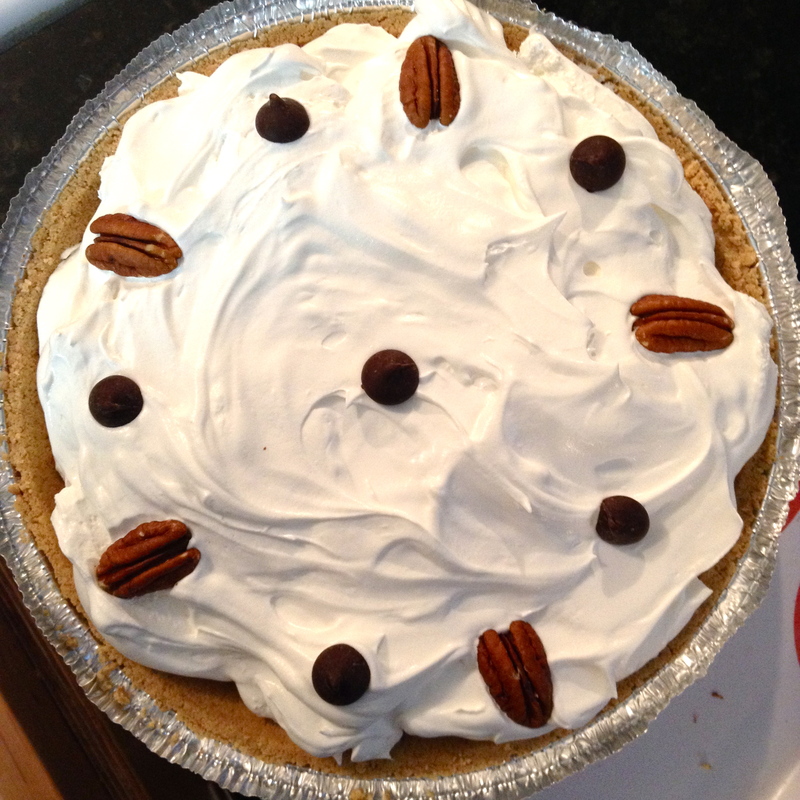 Just let the pie chill in the fridge for at least an hour before serving. This is a really nice base recipe that can be tweaked according to your taste. 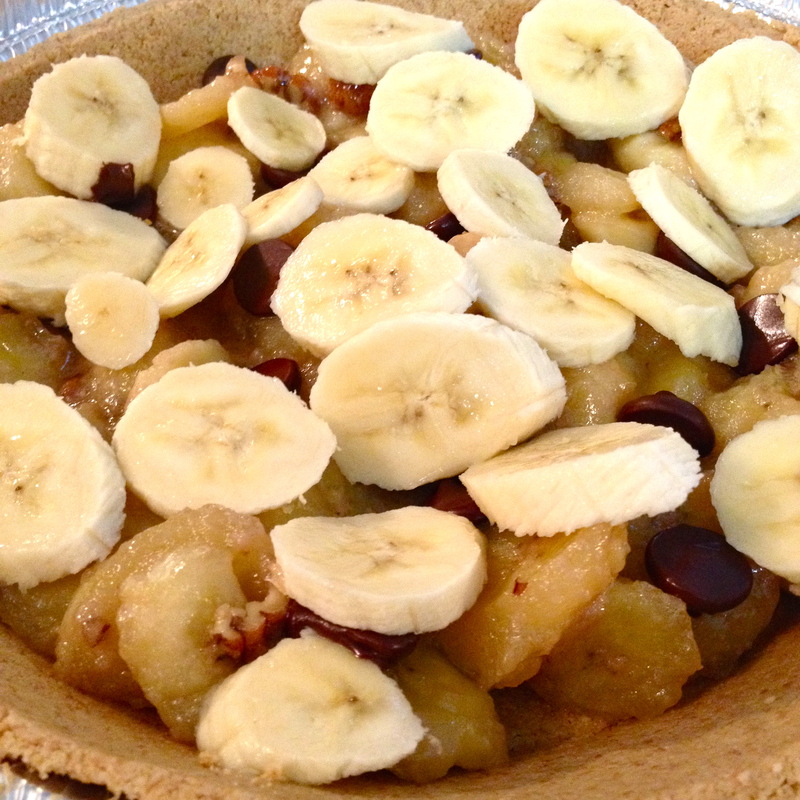 You can change up the fruit, add oatmeal, or just add lots of pecans and make it a pecan pie! Enjoy! I just had a question about an old recipe u posted called Rattlesnake Pasta, the recipe calls for a 1/2 cup of sliced jalepenos… is this fresh or the pickled kind? Hi Amina! Thank you=) I always use the pickled ones, but if you end up trying the fresh ones let me know how it turns out!